Aphids or “plant lice” may infest almost any ornamental trees, shrubs and flowers. They feed by inserting microscopically thin mouthparts into the plant phloem and sucking out sap that is rich in sugars. 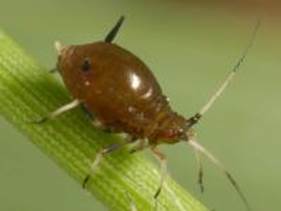 As they feed, aphids also inject saliva. This saliva causes some plant leaves to curl or crinkle and flower buds may become hardened, causing the flowers to be distorted. Overall plant vigor may suffer. However, their ability to transmit plant viruses may be more harmful than any direct feeding damage. Aphids are slow, fragile, insects that vary from 1/16 to 1/4 inch long. They can be black, brown, yellow, red, gray or green. They are more commonly found on camellia, crape-myrtle, gardenia, hibiscus, ixora, oak, oleander, ornamental grasses, palm, rose, as well as nearly all annual plants. Most aphids feed on the new plant growth. Ants feed on the honeydew and when ants are observed, plants should be examined closely for these sucking pests. Examine your plants weekly during the spring, summer, and fall. Look at the undersides of a few leaves on each plant and observe the stems for aphids, especially the new growth. Many natural enemies of aphids include lady bugs, green lacewings, parasitic wasps, assassin bugs, ambush bugs and spiders. Sometimes these parasites and predators are not able to keep aphids under control, so chemical control may be needed. Usually aphids are not difficult to control with insecticides. But, plants may become re-infested from adjacent areas throughout the year. 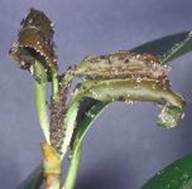 If you notice or see Aphids on your plants and they are looking sickly, call 239-455-4300 Collier Pest Control for a full explanation on how we can rid you of plant eating insects, or look us up on our website at collierpestcontrol.com. Remember Florida does not have to be shared with insects!